Of course I’m wondering whose kitchen and where (Scugog, I see, but beyond that?). It seems it might be a group kitchen of some sort — in a community centre or church or group home? Safety first: the fire extinguisher on the wall. 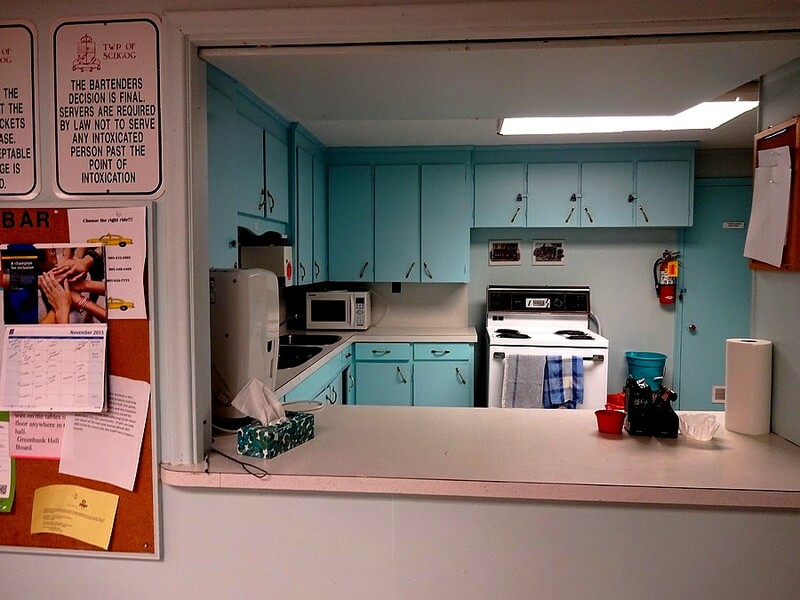 What makes this photo intriguing, aside from that pastel blue on the cabinets, is all the details the viewer takes in: the tissues on the counter, and the coffee filter ready for use; the tea towels hanging on the oven handle. And is that the handle of a fly swatter at left? Then there’s the bulletin board jam-packed with calendar and signs and notes. Is the Township sign meant to be humorous? What point is “past the point of intoxication”? It’s a pristine kitchen, at any rate. This photo piques my curiosity (as it’s meant to do)! I wondered about that too: past the point of intoxication. Sounds like the bar (ahem) is set pretty low. Drat, my comment just got eaten by a gremlin. Can I ever recapture those immortal words? I feel I’m peering into a kitchen in a short story, though not sure by whom. Such a sense of conscious retro-ness here, a sense of self(s). With a sense of humour of a sort. Nb. the dire drink-serving memo on the wall. Ah, but then the “hands” calendar. So, lots of seriousness of purpose along with a certain strived for lightness of spirit. Dang it all, there IS a story here! But I’ll have to give up guessing and quote Butch Cassidy instead. “Who ARE these people?”. I love the picture, I love the way you’ve caught all this … but I’m not entirely sure I’d “love” the inhabitants. Such cleanliness! I love this retro turquoise gem Carin! I can just see the community dance taking place in the attached hall where no one passes the point of intoxication! It’s the turquoise that got to me! Something about this looks like a dollhouse to me. I can see it’s not because of the signs (unless the dollhouse maker has a very particular sense of humour) but it all feels sort of miniature and perfect in its colours and detail. I guess it’s also the way the room feels complete and self contained, yet entirely open and visible from outside. Absolutely Elizabeth — that was my first reaction too! A doll’s house. It does really have that feeling.Very thought-provoking shot, and I am hoping we will learn more!